In a small room, in a small town, on a cool overcast April day, five connected hearts beat together one last time. It was captured in a photograph too powerful to ignore—four sisters and their final moments with their ninety-one-year-old mother. 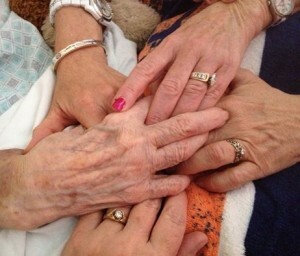 My Aunt June hung on long enough for all of her daughters to reach her bedside—one final gift. While the world spun in its normal hectic pace outside those walls, time must have felt suspended as four sisters held on to each other, their differences inconsequential as one common purpose emerged: comforting the woman who so often comforted them. I hope you’ve had an Aunt June in your life; a simple woman who wasn’t a Hollywood starlet, never ran a corporation, or wrote a best-selling novel. Hers was a quiet strength. Widowed young, she raised four girls on her own. She even had enough love to share with another young girl who would grow up to be my mom. I have this theory: Until we reach our real home, we’re only given glimpses of all that love is—snapshots that look a lot like June and the hands holding her’s. It’s a picture of hope to share on this Mother’s Day. You see, I think the reunion will be sweeter than their sweetest day together. I think the love in that room will pale in comparison to forever’s beginning. And their connected hearts will beat together once more. Until then, the world spins on. There is life to taste, ball games and dance recitals to attend, and walks on the beach to take. There are milestones to celebrate and glimpses of love to capture. Hold on to hope…and to someone’s hand.